Oh what a weekend of running. 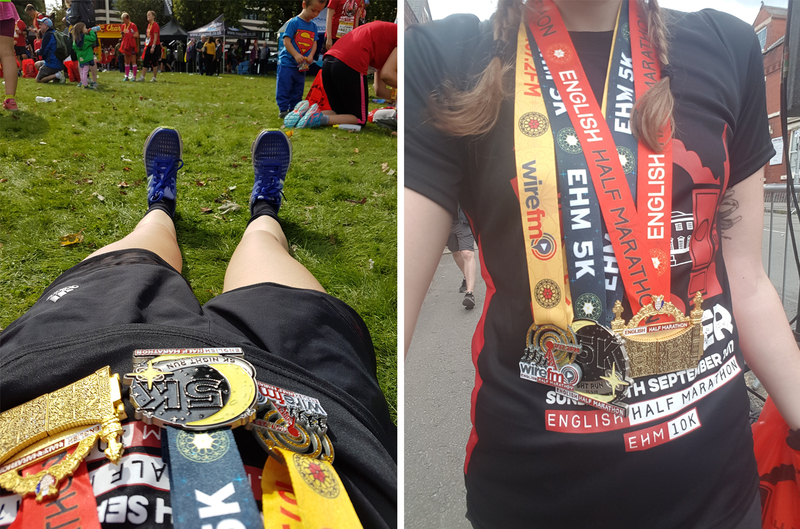 The English Half Marathon was something I was really looking forward to, and I enjoyed it so much on the day – even if my legs did hate me for a couple of days afterwards! They still feel a little funny actually. 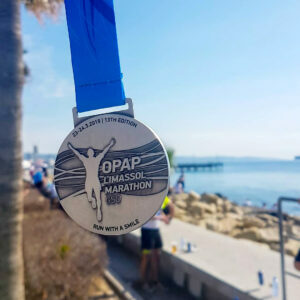 When I booked these races, I only signed up for the half marathon originally. It was way back in May, and I figured I’d have tons of time to train. Which I did, but admittedly didn’t do as often as I should have. That said, I wasn’t too worried as I was pretty sure my legs could get me around. Or at least will power… Anyway, for some reason I thought it’d be a great idea to sign up for the 5k on the Friday, and then add in the mile after my half on Sunday! The weekend started with the 7:30pm 5K Night Run on Friday 15th Sept. I’d never done a 5k or a night run, so this was all new for me. How did I get on? Yep. So we didn’t actually run 5k. I’ve seen a lot of disgruntled comments on Facebook after this race, and I mean I get the annoyance. I do. It should have been my first properly timed 5k and instead, it was a 4.1k. At the end of the day, it’s just a race. I overheard someone saying that a direction board had been moved or turned, and so it seems the front runners didn’t see the turn off (which would have added up to complete the distance). Instead they ran straight, and we all followed. That’s not their fault. One thing that would have helped (especially with it being a run in the evening) was more marshalls covering all the turns. Either they didn’t have enough volunteers to spread out, or they didn’t think it necessary. Whatever the case, it’s something to think about next year! Despite all that, I enjoyed the run itself and it was actually quite nice to be running on grass and soft ground for a change! And then it was time to relax and get ready for the main even – the half! And then I panicked a little because I realised my phone was on 7% and the plug socket hadn’t been charging my phone overnight. With no other free sockets in the room, I went back to the original and discovered that what I thought was a flattened switch, was actually a working switch. And of course, it hadn’t been turned on… Typical. I plugged my phone back in – checked it was actually charging – and then got dressed and headed down to breakfast. 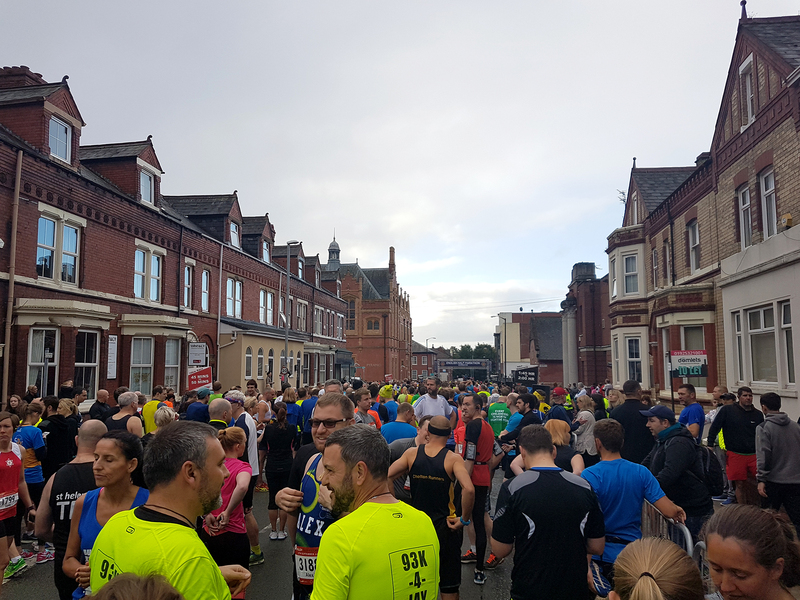 I touched on this in my Snapshots From Warrington post earlier in the week, but the hotel had organised their breakfast to run half an hour earlier than usual for the runners staying. I was greeted by a lovely lady who asked if I wanted toast (yes please!) and looked around to see bright colours everywhere. Yep, everyone at breakfast so far was clearly running today. Although the cooked mushrooms were very tempting, I stuck to eating just toast in the hopes of not upsetting my stomach. Nothing worse than feeling like that on a run! 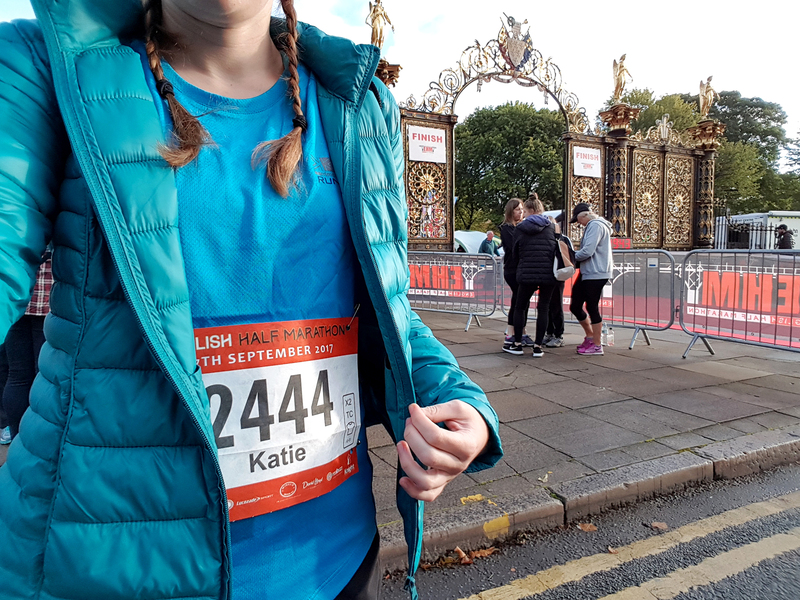 Then it was time to go, and luckily the starting line and finishing area was super easy to find and close to where I was staying so I didn’t have far to go. We ended up queueing for a while, and the race did actually start a little late – with us getting rained on occasionally thanks to the indecisive sky not knowing what it wanted. As I started into the first mile, the nerves kicked in. I had 13 miles to go. My legs already felt kind of weird. What if I have to stop? What if I just do terribly? I knew I was running fast. Faster than I needed to go to hit my desired finishing time of 2h15. I always find it difficult at the beginning because everyone does just set off fast. That said, that fast first mile or kilometre gave me a bit of leeway on the rest of my pacing haha! Turns out, almost all the first half of these 13.1 miles were going up hill. Gentle, slow going hills that seemed to just last forever. It was probably around 2 or 3 miles when the 2:10 pacers appeared, and oh boy they were so helpful. That’s what they were calling themselves, and the small group staying close to their sides. They were constantly throwing out positive comments and useful tips, keeping moral up and pushing everyone forward. Saying useful things like when to take gels, when the stations were coming up, when to drop your arms and shake them out and just relax shoulders. I tried to just stay close, close enough that I could hear them. As we were coming up to the half way point I was starting to struggle a little. Thankfully I kept hearing “You’ve all done the hard bit – now we’re going downhill all the way back”. Music to any runners ears. Right? We kept on going anyway, and I was just surprised with myself for actually being where I was. Okay so I didn’t quite hit it – metaphorically of course – but I almost did. We got to around 10 miles and I just felt an overwhelming rush of emotion. 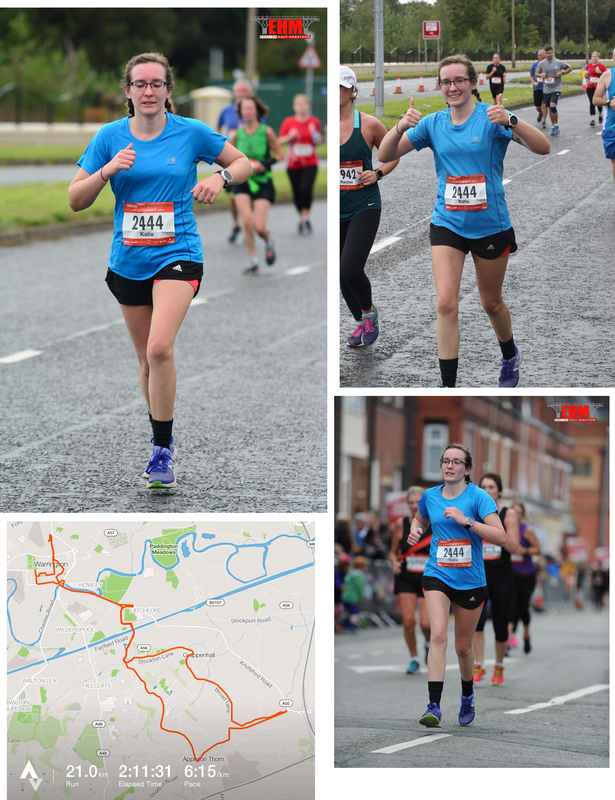 It happened at almost the same point in my Wigan Half in March. Like my chest just went tight and I thought I was going to cry and I don’t know. It was just horrible. Had to force myself to breathe and calm down. I’d lost the 2:10 group, but could just about see them in the distance. I slowed down and walked a little and then a lovely man from a harriers running club (I can’t remember who!) gave me a little boost, and I set off again. Honestly just those few words helped so much. I did do the next two miles mostly running, but with a little walking in between. My legs were just so tired by this point. The pacing team had said to us that once we hit the stadium, there was only 0.8 or so miles left until the finish line. That really helped. One thing with running in a new place is that you just don’t know the area. I should probably have more of a look at race routes before I do them, but hey ho. Maybe next time. Anyway, that last little bit was tough, but we were back in town and there were so many people cheering. I mean the support along the course was amazing anyway. 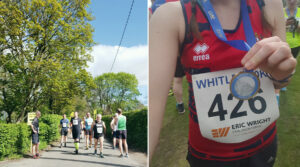 So many people came out to see us go past on the country roads, and plenty even had tubs of sweets for runners to grab! Such a lovely idea. Even though I couldn’t take one because y’know, not veggie friendly. Still, I can appreciate the thought. But yeah, the town was so busy and seeing so many people makes you want to run to the end. And I did. And I hit a new PB. 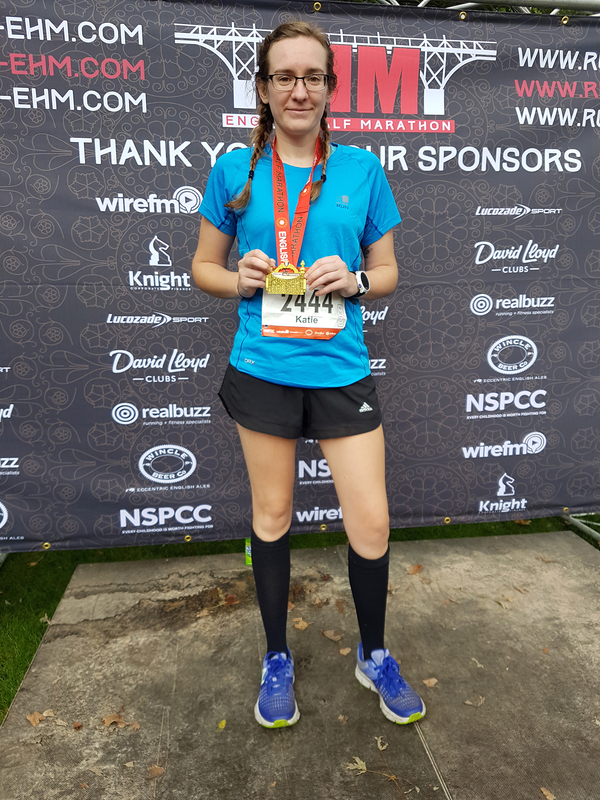 And even though I think my official chip timing is a little off compared to my Garmin (Chip at 2:11:41) thanks to having to queue to get over the second timing mat (bad organisation there!) I’m super happy with it. And then for some reason, I thought doing another mile would be a great idea. Yep. This was probably the most painful mile I have ever run. I had kids flying past me and all I could do was waddle around haha. I even had to walk. I’d just done a half marathon, yet I had to walk on a mile because I felt so unfit. I mean, pretty much explained due to the mileage I’d just done, but you know… It was hard. Aren’t the medals amazing though?! I did also get a X2 one, and should have a Triple Crown medal for doing all 3 races over the weekend, but they’d run out of those and said they would send them in the post. Here’s hoping for that one… On a serious note though, it was such a great weekend and I’m so glad I did it. So much running. I’ve rested all week and am aiming to get myself around Park Run this Saturday as my first run back. Wearing my new race top of course!